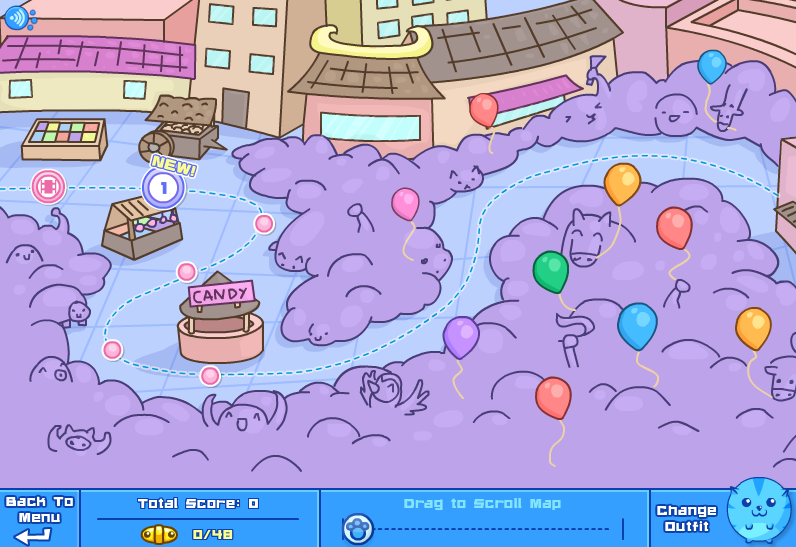 Sushi Cat 2 is a cute, funny flash game about a big, lovable blue cat named Sushi Cat. It is a sequel to the game Sushi Cat – The Original. Sushi Cat 2 takes place inside Tokyo Mall. While Sushi Cat and his wife (we’ll call her Mrs. Cat) were out shopping, the evil villain Bacon Dog kidnapped Mrs. Cat! Now, Sushi Cat must go through various obstacles to try to rescue his wife. Can you help him rescue his wife from the evil Bacon Dog? To help Sushi Cat rescue his wife, you must pass each level of strategy games by eating as much sushi as you can! Eating sushi helps Sushi Cat gain weigh – ultimately growing larger so he can perform the necessary actions to reach his beloved wife.  Pinball Flipper. When this power-up is activated, click on the pinball flippers (near the bottom of the screen) to try to toss Sushi Cat back up into the air to collect more sushi. Be careful – you only get 10 flips, so plan wisely! Game Sushi Cat 2 has made the gaming experience more personal, with the inclusion of the Golden Sushi. As previously mentioned, collecting the Golden Sushi unlocks the ability to change Sushi Cat’s clothes. He can be a pirate, an archer; you have 10 costumes to choose from! Additionally, after every 5 levels, you can watch a cute video about what is going on in the story-line next. Don’t want to watch the video? No problem! You can just skip it and go right into playing the next level! Armor Games, the developers of the Sushi Cat games, have thought of virtually everything with this version! Not only do you get the great features mentioned above, as well as a brightly colored game, and the option to change your cat’s outfits – but you can also toggle the music on/off, scroll the map to see how much further you’ve got to go, and replay previously played levels. Not everyone likes to cheat, or use cheat codes, for playing games. For those of you who do, we’ve done a little research for you. By doing a simple google search, you can find a few sites with some “built-in” cheats (built-in meaning it’s a copy of the game, but has been changed slightly to allow for the cheat to be used). Some sites we found allowed you to start out with more cats (lives) than your standard 5 lives. Other sites we found provide a downloadable program you can install on your computer that will allow you to cheat your way through levels 1-5 – even play the game for you while you are away! This game can easily be played by children as young as 3 or 4. There is no harmful images or foul language. It is a great game to encourage critical thinking and decision making skills.